By default, if you post an animaged image in Slack, it will automatically play–and some can be quite annoying. If you would rather not see every animated image play automatically, you can easily disable this feature. To prevent this, open the Slack app to any channel and tap the menu button in the upper-right corner of the screen. Tap “Settings” on the menu. 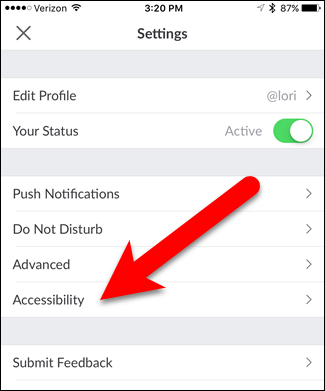 On the Settings screen, tap “Accessibility”. Tap the “Disable Animated Images” slider button so it turns green. Now, animated images will not play automatically. They will display as static images. 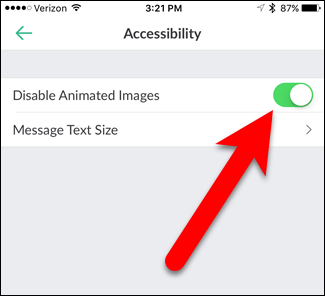 NOTE: Slack is set to automatically play animated images unless Reduce Motion is enabled in the iOS settings (General >Accessibility > Reduce Motion). 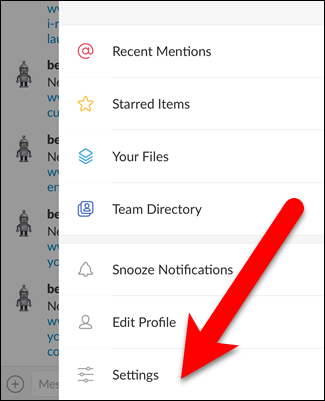 If you had Reduce Motion on when this Slack feature was launched, Slack will have turned it on, and animated GIFs will not play. It does not appear that altering one of these settings affects the other after the fact, though. Unfortunately, with animated images disabled, GIFs turn into static images that cannot be played manually one at a time. If you want to see one animated image play, you must turn off the Disable Animated Image option and let all the animated images play. It’s either all or nothing. But, at least it’s easy to toggle this setting.